Second, an AVA designation gives a wine a place of origin, even if it doesn't meet the estate condition. Since 85% of the grapes must be grown within the AVA, it gives consumers confidence that a particular wine labelled with an AVA contains fruit grown in that jurisdiction. Perfect for the locapour movement. Finally, an AVA designation provides a huge marketing advantage to the area and even the state, particularly when the Virginia Wine Board and the Secretariat of Transportation and the Secretariat of Agriculture and Forestry get involved. These agencies have developed the Virginia Wine Region Sign Program which, as you would expect, road signs promoting the various AVAs and wine regions within the state. In September of 2012, the TTB announced that Martin's petition had been approved and the Middleburg AVA was officially created. The AVA boundary is quite detailed and maps to 46 unique points bounded by the Potomac River to the north and mountains to the east, south and west. The TTB lists these map points in detail here. In total, the Middleburg AVA covers approximately 190-square miles (121,600 acres) and contains 229 acres of commercial vineyards and 14 wineries. I've created a map of these wineries that is also embedded above. 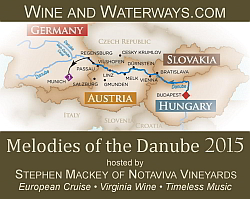 It includes many of our favorite NOVA wineries, but is also interesting in terms of those that are outside the boundary. For instance, the borders exclude eastern Middleburg and Chrysalis Vineyards as well as the western slope of Short Hill Mountain and Breaux Vineyards. Other neighboring wineries may feel disappointed, but all should expect to benefit from the designation as well as the Virginia Wine Region Sign Program. 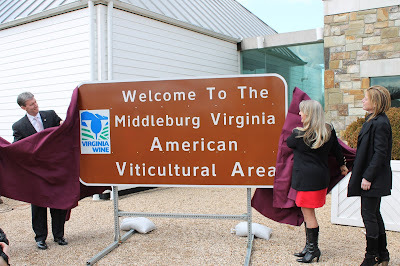 And yesterday, March 26, First Lady Maureen McDonnell and Secretary of Agriculture and Forestry Todd Haymore unveiled the Middleburg Virginia AVA sign at a ceremony hosted by Boxwood. Both the sign and AVA designation will assist in the continued expansion of the Virginia Wine Industry. In the words of Rachel Martin, "This AVA designation promotes Northern Virginia as a recognized US wine growing region further placing Virginia in a national context of making wine and allows us to tell a more comprehensive story of Virginia vineyards, wines, viticulture and winemaking practices."